I know! It’s a repost! Moral of the story: If you’re going to murder someone, make sure you have 20/20 vision. Or at least wear contacts. Probably had something to do with him not confessing or accepting a plea deal of some kind as well. The man on the right admitted that he committed a crime. Regardless of of what the man on the left said, he was convicted “beyond a reasonable doubt;” people say that jets did not hit with twin towers, but really any doubt that it happened is unreasonable. Is it possible that the man in the left didn’t do it? Yes. Is it possible that the man on the right did not do it? Yes, time travel, unknown evil twin, so on, however is that really reasonable? No. 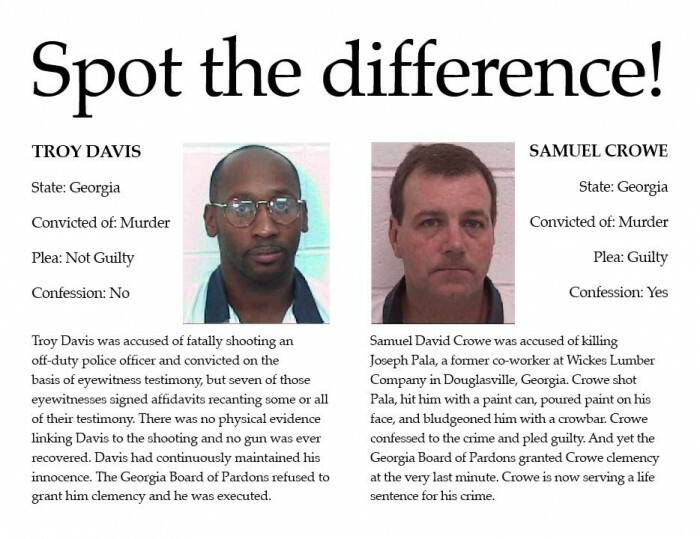 There was no evidence in the Troy Davis trial? 22 witnesses that didn’t recant. 2 that did and the defense didn’t put on the stand because they had obviously been tampered with.